Rome walking tour – Tiber Island – Even if over the centuries flooding of the Tiber caused devastation and embankments, built in the late 19th century have irrepairably altered the townscape on the banks of the river, the Tiber Island and the old Ghetto, where the Jewish community of Rome have lived since the IV.th century BC.,it still maintains its old caracter and interest. 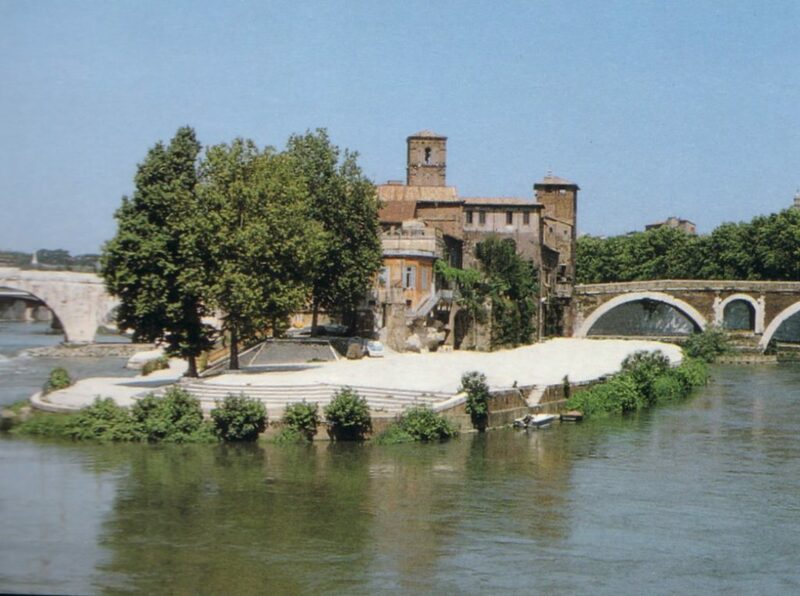 This Rome walking tour includes also the visit of : The Tiber Island (Isola Tiberina) is a pretty river island which can be reached from both banks by two bridges. The Fabrizio Bridge (Ponte Fabrizio) is the oldest bridge of Rome, dating back to the 62nd BC., it is also known as „Ponte Quattro Capi” ,it stands on the right bank joining the island to the Jewish Ghetto. Cestio Bridge (Ponte Cestio) was built in 46 BC., and it joins the island to the medieval district of Trastevere.These two bridges have for centuries, especially in the dark middle ages up to the 18th century, been the main artery of communication an commerce of Rome. The remains of Ponte Emilio (Pons Armilius), the first stone bridge built over the river, in 179 BC, is visible in the bed of the river. It was repaired several times but it collapsed in 1598, and left a standing ,single arch known as the Broken Bridge (Ponte Rotto). Since 293 BC the Island was considered to have been the only easy-crossing place over the river, it was consecrated in the name of Asclepios (for the romans Aesculapius) the God of Healing. After 23 centuries the Island is still associated with healing, in fact it’s largely occupied by the Hospital of the Fatebene Fratelli, found in 1548 and built on top of the visible ruins of the ancient Roman Templeof Asclepios. Other remarkable buildings are the Church of San Giovanni in Calarita,the 11th century medieval tower, the Church of San Bartolomeo, 10th century with its interior decorated by 14 antique columns and ancient sculptures that were once part of the Temple of Asclepios. End of tour. Rome walking tour – Tiber Island itinerary can be modified according to customer needs!!! We are able to offer Rome walking tour in a wide range of languages, should you wish to book a tour in a specific language (apart from English and Italian) please follow the relevant link below. Rome walking tour suitable for children, for disables if ,with wheelchair, on request.